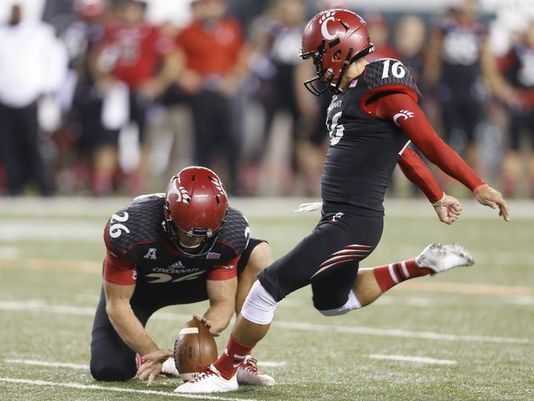 Perhaps the most exciting moment in Cincinnati’s 2014 football season was the 47-yard game-winning field goal by redshirt freshman Andrew Gantz to beat ECU under frigid weather conditions. Head coach Tommy Tuberville has no trouble describing how he felt at the time. Cincinnati had a five point lead with 2:03 left in the game when Tuberville elected to go for a first down on fourth-and-2 from the Bearcats’ 33-yard line. An option pitch lost six yards and ECU scored a go-ahead touchdown with 1:02 remaining. Fortunately for Cincinnati, Gantz answered with his clutch field goal with 15 seconds on the clock. The field goal was the longest that Gantz made as a freshman. The Centerville H.S. grad won the kicking job last year after a nip-and-tuck training camp battle with senior Tony Miliano and went on to have a great first season, making 16 of 20 field goals and earning second-team All-American Athletic Conference honors. “I hate missing a field goal more than I like making one, if that makes any sense,” said Gantz. One of Andrew’s off-season goals is to increase his range for the upcoming season. “He’s been killing it in the weight room trying to get bigger and stronger,” said Linder. Andrew says his longest field goal in practice is 67 yards – or 20 yards longer than the game-winner that saved Tuberville from having to agonize over a costly gamble. As his parents, your announcing made Andrew’s game winning kick even more thrilling to watch and listen to! Gives us chills every time! Thank you!